Out of those beats, Padulo estimates that 50 of them have made it to “song status,” while others are left unfinished until later. “There are some beats I just hold on to and don’t show until I find the right person who fits with the sound of the beat,” said Padulo. Padulo is familiar with several digital audio workstations, like ProTools, but gravitates toward one in particular. 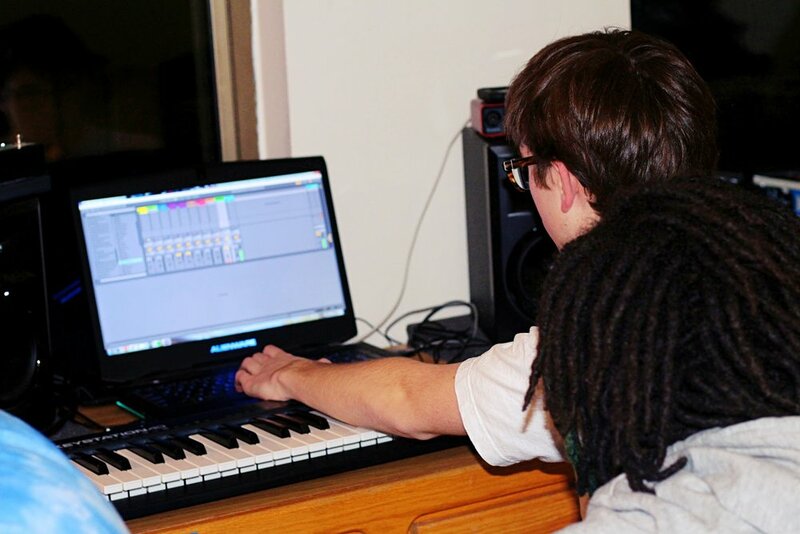 “I pretty much use Ableton although, working with other people, I’ve gotten to know Logic because it’s pretty straightforward,” said Padulo. Padulo describes music production as “an open-ended artistic pursuit.” The music industry is full of chance - giving those who are beginners the same opportunity to excel as anyone else. As with most things, learning can get frustrating. But, music production is unique because the key is to remember that there isn’t a right way to do it. “You’ll see results fairly quickly compared to most disciplines with music because there's so many ways to approach it. You can record instruments, you can do everything digitally, or just program. You can find your way in a year. It’s very achievable,” said Padulo. Padulo is currently pursuing a degree in audio production but started making music with his friends in high school. It wasn’t until his senior year of high school and, more recently, freshmen year of college, that he started producing and engineering projects for other artists. “I was always interested in music as a kid and it's not something that I actively pursued,” he said. His father played in a metal punk band growing up, and Lucas followed a similar path. In addition to picking up skateboarding like his father, Padulo was a part of his high school’s jazz band. But, he found himself attracted more to hip-hop and started producing for and working with other artists. Raised in a musically-involved home, Padulo’s mom also grew up listening to hip-hop, eventually getting his dad into it as well. Padulo speaks on how supportive his family is in regards to his pursuit as a music producer. “I think they know how much I’m dedicated toward getting whatever job is gonna be practical... I think they trust my follow through,” said Padulo, and his parents are “happy for him,” as long as college is still in his story. Padulo says his top five dream collaborations are Young Thug, Taylor Swift, Post Malone, Trippie Redd and Drake, but Padulo’s dreams don’t stop there. He also has a goal to be on the Billboard Hot 100 at least once by the time he's one year out of college. Where’s the Love for AU’s Women’s Basketball Team?